Overly Animated Podcast | We take animation seriously. | Page 4 Overly Animated Podcast – Page 4 – We take animation seriously. Dylan Hysen, Michelle Anderer, & Alex Bonilla recap the new February episodes of Craig of the Creek: “Bug City”, “Deep Creek Salvage”, “The Shortcut”, “Dibs Court”, & “The Great Fossil Rush”. 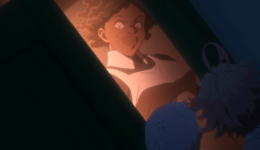 Andy Potter, April Collins, & Steve Zec recap Episode 7 of The Promised Neverland, “011145”.